Mexico's young democracy faced its greatest test yet Monday as the pro-business Felipe Calderon declared himself president-elect with a 402,700-vote advantage and his leftist rival vowed to use every legal means to challenge the apparent victory. Electoral officials said a preliminary count gave the conservative Calderon an edge of 1 percentage point over Mexico City's former mayor, Andres Manuel Lopez Obrador, but refused to declare a winner until an official count that was to begin Wednesday. Sunday night's rapid vote sampling, which election officials had hoped would show the winner, proved too close to call, setting off days of uncertainty and cries of fraud by fervent Lopez Obrador supporters, still bitter over manipulations that kept the Institutional Revolutionary Party, or PRI, in power for seven decades until 2000. 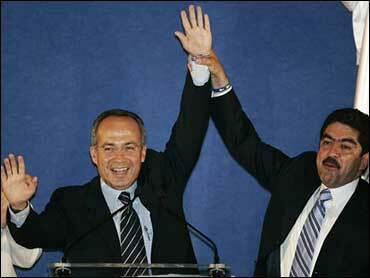 Both candidates immediately declared victory despite the Federal Electoral Institute's restraint. Appearing nearly giddy in a Monday morning television interview, Calderon said he clearly won and vowed to build a conciliatory government to mend rifts after an angry campaign in which nearly two-thirds of the 37 million voters chose other candidates. "It is time to put our divisions behind us," he said. Lopez Obrador holed up in his apartment for most of the day, later arriving unannounced at his campaign headquarters to defend what he says was his triumph in the election. "We have a commitment to the citizens to defend the will of millions of Mexicans," he told supporters. "We are going to employ whatever legal means." Lopez Obrador suggested there may have been some irregularities in the vote count, asking how it was possible that his party won 155 of 300 electoral districts without winning the presidency. "The process can be reviewed without making anything up, and acting responsibly, and in that way we can find out the truth," he said. Many had predicted violent street protests if the vote was too close to call, but Lopez Obrador supporters apparently were waiting for orders from the leader they revere with a near-messianic devotion. Lopez Obrador did not call for any demonstrations in his speech. Financial markets rallied Monday on preliminary results that showed Calderon, a fiscally conservative former energy secretary, in the lead. "The presidential election in Mexico is more critical to Americans than most people realize," says CBS News foreign affairs analyst Pamela Falk, "because immigration reform, border security and drug enforcement in the U.S. all depend on support from the Mexican executive. "Although election results are not confirmed, the candidate who ran on a platform of cooperation with the U.S., from the ruling National Action Party, appears to hold a small but significant lead," adds Falk. With 98.45 percent of polling stations reporting, Calderon of the National Action Party had 36.38 percent and Lopez Obrador of the Democratic Revolution Party had 35.34 percent. The PRI's Roberto Madrazo was a distant third with 21.57 percent, and minor candidates and write-ins accounted for the rest. The outcome will determine if Mexico stays in lockstep with the United States, embracing free markets, reports CBS News correspondent Bill Whitaker or shifts left, away from Washington, like a number of Latin American countries have recently. The fact that it came down to Election Day with the race too close to call and the fact that so many people turned out believing their votes could make a difference is considered a triumph for Mexico's budding democracy, Whitaker adds. Calderon brushed off comparisons to the electoral crisis that followed the U.S. 2000 election, in which George W. Bush narrowly defeated Al Gore. He joked that his country's northern neighbor could learn from Mexico. "We have such advanced institutions that we can do what the United States couldn't," he said. George Grayson, a Mexico expert at the College of William & Mary in Virginia and a former Virginia state legislator, said that "the Mexican system is much more transparent" than the U.S. system. Mexico has a single voter registry, a uniform photo identity card for voters and a national election law, he said, whereas "in the U.S., you have this crazy quilt of 50 state laws." Mexico's Federal Electoral Institute is legally independent of the government, providing taxpayer financing for political campaigns based on vote totals in past races, an effort to even the playing field. Mexico also sharply limits private campaign contributions. The silver-haired Lopez Obrador, famous for mobilizing enormous protests, warned the fight was not over. He said he was asking supporters to help him examine Sunday's vote, widely considered to be the country cleanest ever. "Have patience," he told supporters earlier Monday. "We are always going to act responsibly. If we lose the elections I will recognize that. But if we won the vote, I'm going to defend my triumph." Lopez Obrador supporters compared the vote to that of 1988, when many believe the PRI robbed leftist Cuauhtemoc Cardenas of victory. "We won, but they're going to take it away from us," said security guard Victor Ramirez, 43. "There are going to be vote challenges, and I think there will even be demonstrations." The PRI came in third in the congressional vote as well, but the party could emerge as the powerbroker as the new president-elect seeks to build consensus in a divided Congress. In congressional voting, National Action had the most votes — nearly 34 percent. But due to a complex system of proportional seats it was unclear how many lawmakers each party would have. Certainly, no party was near to a majority, meaning the next president will have to reach out to his rivals to get anything done.